I was browsing through millions (okay maybe thousands) of multiply shops when I came across NITA CLOTHING. I did my usual routine of spot checking the photos first to see if there's anything that'll interest me. Then I noticed that the model, looks somewhat familiar. I then discovered that she is indeed familiar, she's my kabarkada in St. Scho in Grade School. Hehe! I also attended a officemate's wedding last March of 2007 and discovered that they are the ones who tailored her wedding gown and the whole entourages'! Small world hehe. Anyway, the clothes are super pretty (can't think of a better term) , fashionable and can be a staple to anyone's wardrobe. They have casual dresses, formal dresses and tops. I wanted to keep this to myself coz I'm sure soon everything will be sold out in a day but I decided to share it anyway since I want to support my friend. Hehe! Here are the tops I ordered! And I'm so excited to wear them! 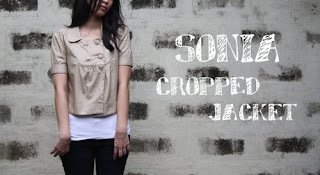 Gaynor top for only P398! 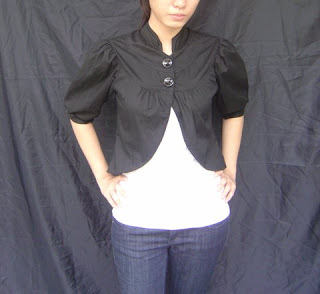 Sonia cropped jacket (i ordered BLACK) for only P388! They make customized clothes, so if ever you don't fit in their standard sizes which are O to 2 (XS-L) you could just send them your measurements and they'll make it for you. They also have a size chart in their website so you don't have to ask for the measurements. These clothes are priced cheap if you compare it with other online shops who would probably sell the jackets for P650, the tops for P700 and the dresses for P800. So these are (in a shopper's point of view) indeed: gold. Haha!